I love salads, but I’ll be the first to admit that they can get a bit boring after a while! Sadly, in the Winter it is often: veggie consumption down, carb consumption UP. But…..I do feel (and look) my best when I’m eating lots of vegetables, so I decided to make an effort to pack more into my day. The only downfall with my salad challenge is that salads can become boring pretty fast if I don’t get creative! The other day I was eating a rather boring salad and I thought to myself, Wouldn’t it be fun if I could make a high-protein salad topper that would be easy to sprinkle on my salads? Then the wheels got turning and I started to think of different flavour combinations and I pretty much ran to the kitchen to try it out. 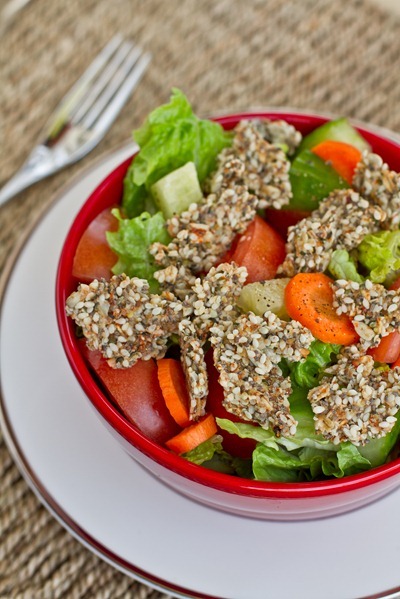 These salad toppers are high in protein, fibre, healthy fats, and pack in a ton of nutrients. They will give your salads (or bowls of cereal!) some extra staying power too. Have fun mixing up the flavours and making different salad combos. 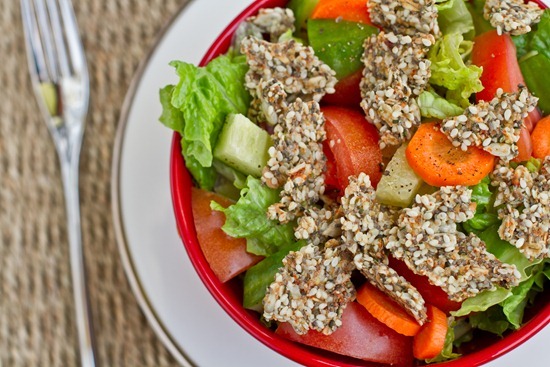 Chewy, flavourful, and super addicting these high-protein salad and cereal toppers will give those boring bowls a boost. Have fun making all kinds of fun flavours! I have included the nutritional info below. Directions: Preheat oven to 350F and line a baking sheet with parchment or a non stick mat. 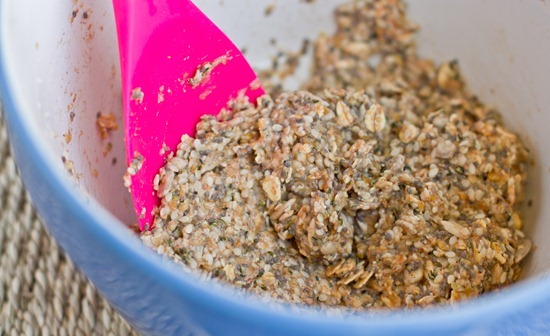 Mix the flax egg in a small bowl and set aside. 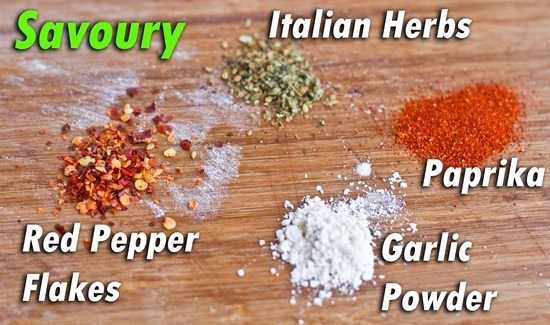 After 5 minutes, Mix all of the above ingredients together in a bowl. Now add in your desired ‘flavours’ by selecting one of the options below or by creating your own flavour! Directions (continued): After mixing in your seasonings, spread the mixture onto your prepared baking sheet as flat as you can by using slightly wet hands or a spatula. You want it as thin as you can get it so it cooks faster. You can now sprinkle on additional herbs if making the savoury flavour or you can sprinkle on sugar if making the sweet flavour. Bake at 350F for 15 minutes. Remove from oven, flip, and break up the pieces with a spatula and bake for another 5 minutes. Allow to cool completely on the baking sheet. Makes about 1.5 cups or a bit more. I served my salad with my Better than Balsamic dressing. Nutritional info (per serving, serves 6): 160kcals, 11 grams fat (1 gram sat fat, 5082mg Omega-6, 1972 Omega-3 fatty acids), 10 grams carbs, 5 grams fibre, 7 grams protein, 0 grams sugar. (Note: This info includes the base ingredients only). 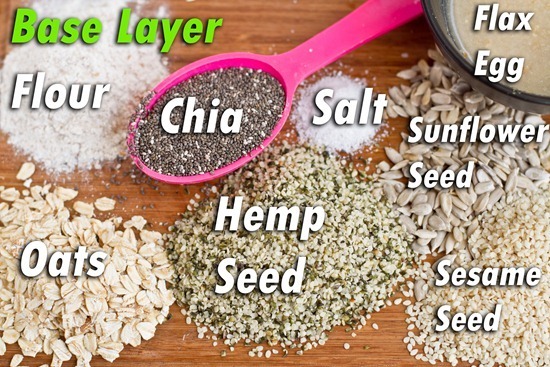 I’m sure you can mix up the seeds too depending on what you have! Now you pick what flavours you want to use. I made Savoury and Sweet versions that were both so good. Mix together and then spread the mixture onto a pan as thin as possible. The thinner you spread it, the faster it will cook. Sprinkle on additional herbs, or if making the sweet version, sprinkle with cinnamon and coarse sugar. Mmmmm. Bake for 15 minutes at 350F and then remove from oven. Flip the large piece and then break up up with a metal spoon. Bake for another 5 minutes and then cool completely on the pan. 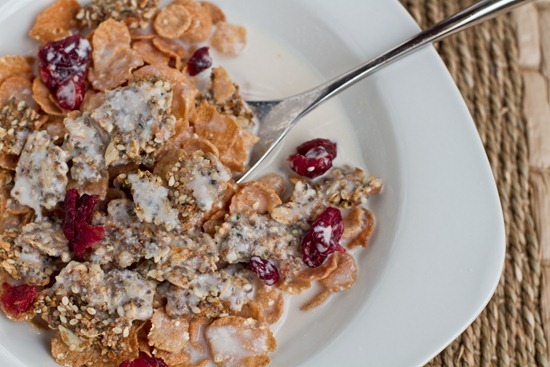 In under 30 minutes, you have the most amazingly delicious healthy salad or cereal topping. I baked mine up chewy, but if you wanted them crispy you could bake them longer. It is totally up to you. They do firm up slightly when cooling, so keep that in mind. I’m going to warn you, they are SUPER addicting! I loved eating them like a ‘cracker’ too. They would be amazing with hummus (what wouldn’t though?). This morning, I discovered that the Sweet cinnamon sugar flavour is also incredible on cereal! It is chewy and really amps up a bowl of cereal in a flash. I’m sure it would also rock in a bowl of hot oatmeal or VOO. Anyone want to join in the salad challenge with me? I’m curious to see what other flavours you guys can come up with! If you have any ideas or make any other versions, leave me a comment below! Yesterday, I got some exciting news. I have been selected as a finalist in Best Health Magazine’s Health Blog Awards in the Eat Well category. Voting is now open and I would greatly appreciate your vote! All you do is enter your name and email address and then click to vote. You can vote daily if you’d like to. Voting is open until March 21 and winner’s are announced on March 31st. When you vote you are entered to win a chance at a free subscription to the magazine. :) Thank you so much for your support! Congratulations on being named a finalist! And this recipe is incredibly creative. I’ll definitely be trying it with hummus. I bet it would be great with a sweet hummus too. Wow! those salad toppers are so creative, Angela! I love how you always come up with something unique and out of the ordinary…My favorite salad combo of late has been a buffalo/ranch theme…chickpeas tossed with hot pepper sauce, homemade greek yogurt ranch dressing with plenty of romaine, celery, carrots, black olives, green onions, and tomato. Love it! These are like croutons. 1000 times better! Congrats! Love the salad and cereal toppers idea. I can always go for some extra crunch. Not so sure about the hemp seeds though- they are a bit funky. Congratulations on becoming a finalist! I’m going to check out that link in a bit. Yummy. I need to get back into salad consumption; it’s so easy to fall off the salad bandwagon in winter, even though they’re so delicious! I’ve been eating a salad most days of the week already! I’m on a big sprouted peas and roasted pumpkin seeds right now as salad toppers. Your topper looks delicious! Love the idea and LOVE veggies! So here’s the salad I made last night (it’s a bit of a variation on the normal salad). I needed to get rid of all the veggies in my fridge (1. so they wouldn’t spoil 2. so I could go buy more). So here’s what happened. I cut the green beans and asparagus into 2 1/2- 3 inch pieces, and lightly steamed them and left them to cool. I added a little bit of lemon juice, olive oil, salt and pepper to the eggplants and zucchini (I peeled and cubed the eggplant and half peeled and cubed the zucchini) and placed them in a cookie pan to bake in the oven (until lightly roasted). I took those out and allowed them to cool slightly as well. (When I used the mushrooms, I just lightly sauteed them in a bit of olive oil with some sea salt.) I mixed the veggies together in a big bowl and then comes the dressing :D.
Combine all the ingredients for the dressing and whisk together. The dressing will be a bit thick, but when mixed into salad, it’ll be perfect (cause it coats everything perfectly). I would spoon it by the tablespoon and mix just to make sure you don’t over coat. Your salad topper looks amazing! 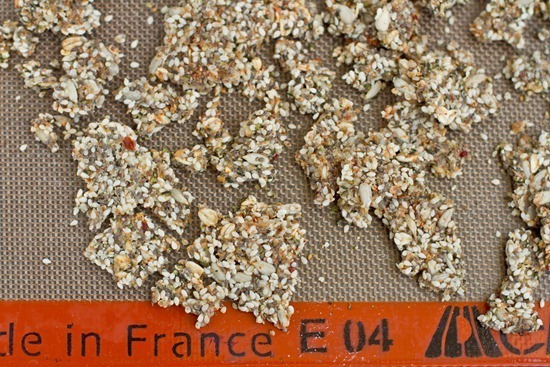 I usually just throw some seeds and/or nuts and call it a day, but I love your idea to bake up a crunchy topper. I need to try this! Mmmm…anything that adds some extra oomf to salads wins in my book! I love salads and usually eat one a day in the warmer months. I really should eat them more often in the winter. This salad topper looks wonderful! Question–What is the mat you put on your baking sheet? Wow, that looks delicious! I love adding a little crunch to my salads. I am really good about getting plenty of fruits and veggies by mixing up which ones I eat. Today I sautéed a couple of beets because I haven’t had them in almost a year, and they were so delicious! Now this is creative! I eat a salad everyday, but I need some of your toppings. i love bright colours in salads, thats the best! I love this idea! Costco just put out a new product that is similar. It’s a salad topping mix that has cranberries, sunflower seeds, etc. I hear it’s great and all natural! I always feel best when veggie intake is high and sugar intake is low – so I’m joining this salad challenge with you! I totally agree!!! I love salads but at some point I just get tired of the same salad!!! :( Now this addition looks delicious! Cant wait to try it!! 1. Spinach (or mixed greens), tomato, cucumber, chickpeas (or white beans), dried cranberries, sunflower seeds, sesame seeds, and a balsamic dressing. 2. Mixed greens, tomato, cucumber, kalamata olives, artichoke hearts, chickpeas, cubed tofu (if you like it), and balsamic dressing. Good luck in the contest! I’m gonna go vote right now! Congrats! I will definately vote for you! What a great alternative to croutons! Your better than balsamic is a HUGE hit in our house – my husband loves it!! I agree about salads getting boring, especially in winter, but I have tired throwing in a pink grapefruit (when on special), or an apple or something like that. I like these crumbles though!! This may be your best (non-chocolate) idea yet! I’d add some sesame seeds and Chinese 5-Spice for an Asian salad. Mmmm! It’s like granola for your salad! I love it! How brilliant. I have so many clients that would benefit from this. Thanks for the fantastic recipe. Just voted, congratulations and good luck! Congrats on being named finalist – Go OSG! Just got done voting. And I’m salivating looking at those salad toppers – yum. What an awesome recognition! I voted for you! I love this idea! Very Fresh-esque. I’ll definitely give it a try. Thanks for the reminder about the CSA — I’m going to talk to my fiance about buying a share this year! As for winter veggies – I always have a big pot of homemade vegetable soup in the fridge that I eat for lunch. It really keeps me on track. Your highprotein green monster split pea soup is in my regular rotation! Any suggestions to make the salad Toppers gluten free.? They sound delicious but I need a gluten and oat free variety. How about quinoa flakes and quinoa flour…that would add more protein too!! wow super cool! I would’ve never thought of something like this. I try and eat more salads too so this’ll help, merci! Congratulations on being a finalist! I love that magazine! Mauk Family Farms has a raw “crust” that looks very similar to your salad toppers…but they cost a small fortune! This will be a great way to boost up the ‘ol salad! Everyday we are getting closer to spring and the start of fresh veggie season, we just finished up our last garden carrots….WAH! Can’t wait…..
Love love love your blog and will vote for you :) Ive added you to my blog list too!! I’ll get on board with the salad a day challange, expecially with valentines day (and my 21st birthday) a few days ago my diet has been more pink frosted topped off with lots of beer than green! My skin looks like crapola because of it! what a creative idea! and much better than butter-soaked croutons. good luck in the competition! This looks awesome – I agree, sometimes salads can be boring… or they can NOT fill me up all the way! I just had one for lunch and I have to tell you that I am still hungry!!! However, I have nothing left to eat. It’s a tragedy. Yum, these sound great. I’m a crouton fanatic, but try to stay away from them unless I take the time to make them from my own homemade bread. That’s a really great idea for salads. I agree that they can be a bit boring during the dull winter months; I too need some salad inspiration. Lately I’ve been really digging the ‘liquid gold’ salad dressing from ‘becoming vegan’, I eat salads just to have that. It’s so tasty, and these crumbles would just amplify it all. Thanks for sharing the recipe! These remind me of brendan brazier’s thrive diet crackers! Such a great source of protein and healthy fats:) Can’t wait to try these! These are such a cool idea Ange! I definitely want to experiment with some flavours. I adore cinnamon so I’m pretty sure I’d love that recipe! Good luck with the Best Health awards – I will DEFINITELY be voting for ya! What a great idea! I eat salad for lunch almost every day during the warm weather months, but in the winter I am really bad about it. They just get so appealing! I do try to eat veggie-packed soups, but this is a great idea for making salads more interesting. Love this idea! I will definitely be giving it a try. I was feeling like veggie consumption was way down in our house too, so I have started buying big containers of spinach or other greens each week at the market. I hate nothing more than wasting food, so anytime I’m hungry I make something salad based! 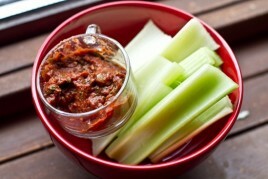 Yum, Yum…those salad toppers look great ~ I think I’m going to have to try the savoury ones real soon. I am like you ~ lots of carbs and not many fresh veggies in the winter; unfortunately my waistline is starting to reflect my eating habits. We have been making all of our salads this winter with kale, and I am totally addicted! My favorite so far is an Asian inspired one with avocado, tomato, red onion, and pumpkin seeds! The lettuce here is looking too sad for me to bear as well, and I HATE buying the pre washed stuff in the plastic tubs. They always go bad within a few days! The recipe for the kale salad can be found on my blog www.consciousearthveg.blogspot.com. Thanks for the great recipe! I’d love to make these wheat free and dehydrate them! Looks like a great salad topper. Much better than croutons. Reminds me of a recipe Averie (Love Veggies and Yoga) came up with for crackers. Ohhhh those salad toppers are genius! I eat a salad almost everyday for lunch and could really use something to spice it up! 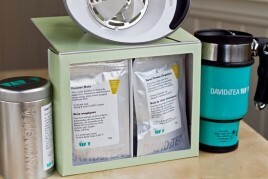 Goodluck in the healthy blog contest! You are such an inspiration girl! I would make a Mexican-inspired topper with dried cumin/coriander/garlic. Maybe some smoked paprika or chipotle chili powder if I’m feeling cheeky. What a good idea to dress up a salad. They do look like they’d be great to munch on like crackers too. Mmm. I’ve been lamenting the same thing – our fresh produce options are less desirable in the winter. Where oh where can I find a decent cucumber? During CSA season, I literally plan my week’s meals around our CSA box. At the end of the season, I have to adjust. And it’s kind of painful. Great idea! I have some dehydrated seed crackers (sesame, chia and flax) that are too dense to eat on their own. Salad, that’s what I’ll use them for! Great idea! Count me in for the salad challenge! Another good salad topper is trail mix- countless options and can add staying power! I think I could probably eat couscous 10 times a day, everyday, I’m not going to lie haha So to add punch to my salads I usually add 1/2 cup of cooked couscous (plain or flavoured). I tend to favour spinach, red onion, red pepper, cucumber, shredded carrots, avacado, jalapenos and sometimes I’ll add black beans too. Toss with whatever homemade dressing I have on hand and I have a great lunch that I can store in the fridge for whenever I need some veggies! Those look delightful! I like something crunchy in my salad, so I would probably bake them longer. Oh….and I am going to join you in the salad challenge too! I have challenged myself to almost the same thing, but mine was to eat a medium to large size serving of dark leafy greens everyday. I don’t always do salad, sometimes I make a green juice or green smoothie, or I’ll put a large amount of spinach in a wrap with hummus&veggies. I have one salad I am absolutely hooked on & have been almost eating everyday since December. It is simply organic spring mix, organic spinach (some spring mix packages don’t contain spinach so I always like to add some) sliced strawberries, sliced almonds and hemp seeds. It is so yummy that it doesn’t need any dressing! Regarding the toppers, love the idea! 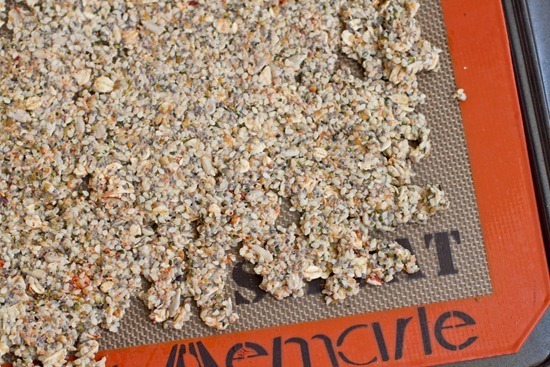 About 6 months or so I posted my recipe for what I call Sweet Seeds Crackers. They are Raw, Vegan, GF crackers that only use seeds b/c too often in raw un-baking, nuts and heavy grains were used and I wanted to keep these lighter and so did them grain and nut free. Sorry for the link drop and just delete my comment if it’s not cool. And your recipe…I love it! 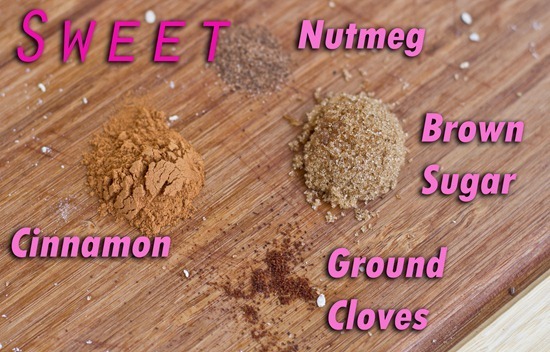 I love all the ingredients you used and I WILL be trying these. Thank you for the inspiration! And yes, salads are wayyyy better and more jazzed up with things like this sprinkled on! That is so exciting news! Do you contact them and enter this stuff – or do they find you? Incredible. Also I think I asked before – I apologize – but is your bakery within your home – you work from home all day? Or do have a separate store? Angela, I just love, love, LOVE your blog :) Thank you for your inspiring posts, and I voted for you in the contest! Best wishes. 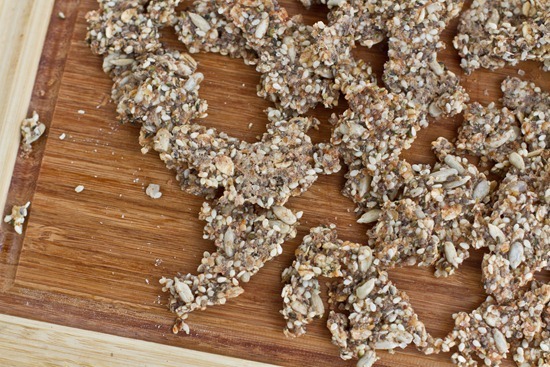 Oh, those look amazing- almost like the seed crackers you made a while back, yes? Definitely going to try your recipe! Also, thanks for this post! I need some more ways to include healthy fats in my diet! WOW, these look amazing. Question: Can I use Energy Egg Replacer instead of the flax eggs? I get in plenty of veggies without salads in the winter. I’ve become almost addicted to steamed vegetables! They are so good this time of year. In a couple of months, I’ll probably get back into salads, though. forgot to mention: I voted for you!!! Love this idea! I get my veggies in during the winter with the on-campus vegetarian wrap station. They have a different one each day of the week, and they’re always filled with a protein and tons of veggies, and awesome flavors! oh these are so wonderfully creative! Congrats!! and love this topper recipe. Congratulations on the Best Health finals!! You have my vote. And WOW….WHERE do you come up with ideas like these salad toppers!?! Awesome!!! We are so on the same page…I am on day 7 of a ‘7 Days of Salad’ challenge, which I just extended through Sunday because it was such a hit. I ate 2 salads per day, and I got creative in what constituted salads and how to put them together. I’ll totally try your toppers. You should try my roasted Mediterranean veggies! These toppers are such a great idea! On some days I find it so hard to come up with a good topper for salad that will keep me full. These are perfect since I can just pull them out of the cupboard when I want them (provided I don’t eat them before they make it onto a salad. ;))! I’m definitely voting for ya. 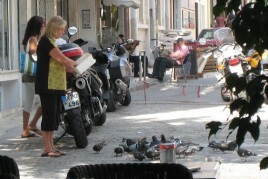 Have you ever read Best Health? I really love it because it’s so much more focused on overall health rather than just weight loss and looking good. I absolutely love reading your blogs every day or at least every other day. I love them even more when you start talking about salads. Your salads always look so refreshing and make me crave them even more. YUMMY for these topping ideas too! GENIUS! I have been trying to find something exactly like that to add the crunchy taste AND be healthy. This made my day. Thank yoooooooooooou. I have one word for this -genius! I’ve recently been trying to eat salads more regularly and this topper will definitely have to be put into my rotation. Quick question: Eating more salads has kind of, er, messed with my digestion and made me feel bloated. Do you think that this will resolve itself over time as my body adjusts? Anyone else have this reaction? I notice you use silpat baking mats – I’ve been toying with buying one for a while now and I’m wondering if you recommend them? Do they work in place of baking paper? Are they hard to clean? I really want an alternative to having to use paper every time I bake and these seem like the way to do it, but I don’t want to waste money if they aren’t any better? What a great recipe! I love an extra crunch to my salads. Even better when it’s not processed crackers or chips! That shot of your salad is SO beautiful Angela ! You’re an turning into an amazing photog. You are so creative! I love it and I’m definitely voting for you :) Congrats on being a finalist! This IS amazing. Great recipe! Congratulations on being a finalist! What a creative way to incorporate some fun into a salad! 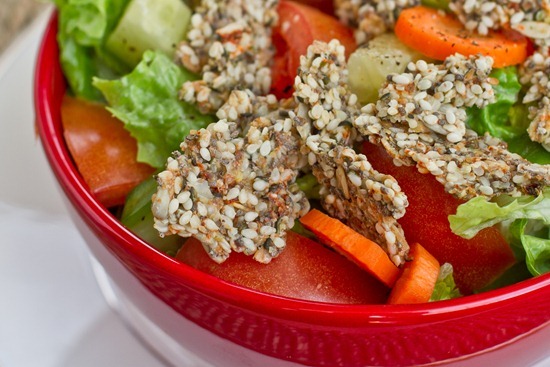 I have been trying to eat a salad a day for about a week and just ordered some hemp seeds from Amazon so I could make your salad topper, looks great! Can’t wait to try it! Oh, this is so fun! Something crunchy just makes a salad complete. I like walnuts and dried cranberries on my salad. mmm delicious! Instead of dressing, I use hummus. When I was a kid, I’d use tomato sauce. My strange food habits started early! These look awesome! They are like better croutons! 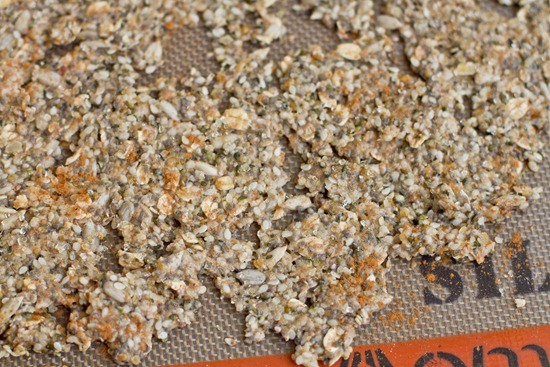 Looooooove this crunchy topping idea. I usually throw pepitas on top, but this is so much more fun. Chris will love it too. We eat a salad with dinner almost every night. I just love them. :) Off to vote…congrats! I was flipping through my local newspaper today (“The Leader Post” – in Regina) and was pleasantly surprised to see you in there!!!!!!!! I first noticed all the Green Monster ingredients, and was like “woah, the Leader Post knows about Green Monsters!”, and then I saw you!!! The salad toppers look wonderful. I love adding more oomph to my salad- makes the leaves and stuff taste better. Congrats on your nomination- good luck! What a great idea! I love adding leftover couscous or quinoa on top of my salads. It’s a nice texture change, and if I heat the leftovers up, its a lovely temperature difference too. This has nothing with toppers, but I have a question making juice since you have great recipes on healthy smoothies and the “green monster”. I was wondering what to get the Vitamix blender or a juicing machine? Will Vitamix perform the same without the mess of the pulp clean up from a juicer? Thank you so much. The VM is a blender and the juicer simply extracts the juice and does not make use of the pulp or fibre. I would always suggest a blender over a juicer any day. Ive heard that the $40 Oster brand came in second place by comsumer reports if you are looking for a budget friendly option. Your recipes and passion for healthy eating have truly inspired me. I know you must hear this a lot but it is so true. I have always had a passion for cooking and baking (which is why it took me 9 years to loose the 60 extra pounds I was carrying around) but passion for healthy cooking was lacking. I thought when I was on a diet nothing was supposed to taste good and if it did it probably shouldn’t be on my plate. But now I see that I was so wrong. I just hit my goal weight this week and now I look forward to staying healthy using tons of your recipes. Thank you for all your hard work. Thanks for the nice comment, Aleasha! Happy to hear of the wonderful changes you have made. congrats! Although I can’t eat cold salads in the winter, I love the idea of adding the savoury ones to my garlic-sauteed greens, or the sweet ones to roasted squash or sweet potatoes. One question – I know you don’t count calories, but how do you fit into your daily meal plan all the tasting of your cooking and baking that you must have to do? I always let my hunger guide me. So if I am doing more taste testing than usual, I won’t eat as big of a lunch or dinner. It all balances out I find! Oh yummy! My mom makes toppers for salad and oatmeal out of nuts, seeds and spices. It’s such a great idea. It also makes the salads so nice and hardy! what a great idea, i’m always looking for some crunch to add to my salad but it usually involves lots of fat and extra calories. these are the perfect alternative to croutons. i voted for you!!! because you DEFINITELY deserve it! Good luck with the Best Health contest!! This is such a good idea! I love salad, but I’m always concerned that I’m not eating enough protein. I have lately been eating salad with raisins, walnuts, and pumpkin seeds, dressed with just balsamic vinegar and a bit of salt and pepper. Congrats on being a finalist. I’m voting for you. Your valentine’s day post made me cry. Hi! I love your site! I recently made a mexican gluten free version of these and I was wondering if I could blog the recipe if I link back to your site and recipe?